Welcome to the second installment of Friday pie day. Friends, this is a good one. 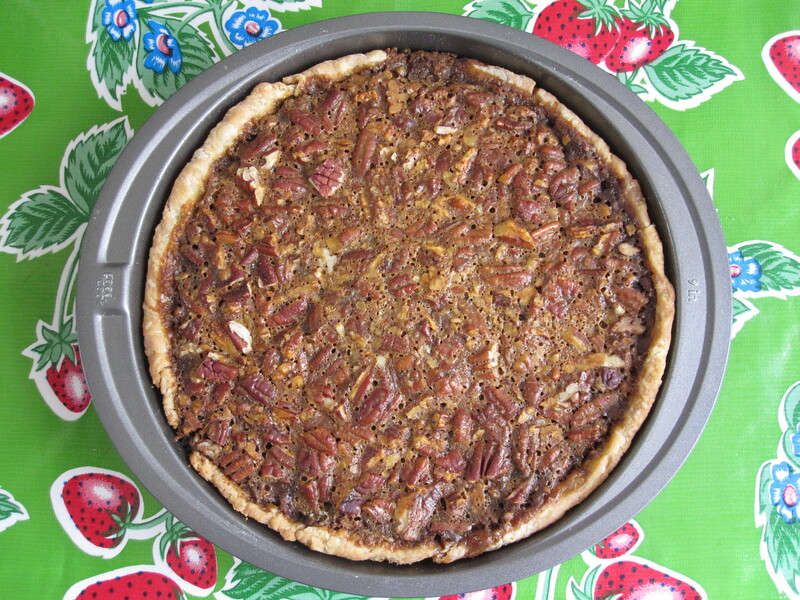 Though I don’t normally think of pecan pie outside of Thanksgiving and Christmas, a pie as delicious and easy to make as this ought to be enjoyed all year round. I originally set out to make pecan pie with homemade sugar cane syrup, since I wanted a recipe that was corn-syrup free, but that little experiment failed miserably. So I was delighted to find this quick and easy recipe that calls for maple syrup, molasses, egg, cream, and brown sugar as welcome replacements for the processed alternative of corn syrup. The toasted pecans and the robust tastes of maple syrup and molasses create flavors much more wholesome than your average pecan pie, and not overly-sweet. I ate a slice and didn’t feel like I had just received my sugar intake for the day, which is always a good measure of a baked good. The more pie I can eat without feeling ill, the better. When I first decided to embark on my pie a week adventure for the month of April, I toyed with the idea of baking a pie a week till I die. But then my pragmatic thinking kicked in, and I quickly realized this was not likely to be logistically, financially, or healthfully possible. But think about it – how cool would that be to be 89 years old and be able to say I have made something in the ballpark of 3,380 pies? Think of the possibilities..
1 1/2 cups pecans, toasted and chopped (to toast, scatter whole pecans on baking sheet and bake at 350°F for about 5 minutes). Make Filling: Adjust oven rack to lowest position and heat oven to 450°F. Heat syrup, sugar, cream, and molasses in saucepan over medium heat, stirring occasionally, until sugar dissolves, about 3 minutes. Remove from heat and let cool 5 minutes. Whisk butter and salt into syrup mixture until combined. Whisk in egg yolks until incorporated. Homemade whipped cream: In a cold metal bowl (I usually put the metal mixing bowl and the mixer blades in the freezer for 5-10 minutes before using; the colder the better! ), whip 1 cup heavy whipping cream. When the cream begins to thicken, add 1/3 cup powdered sugar and 1 teaspoon vanilla extract and continue to whip until the cream forms and holds peaks (but be careful not to over-whip or it’ll start to thicken like butter). 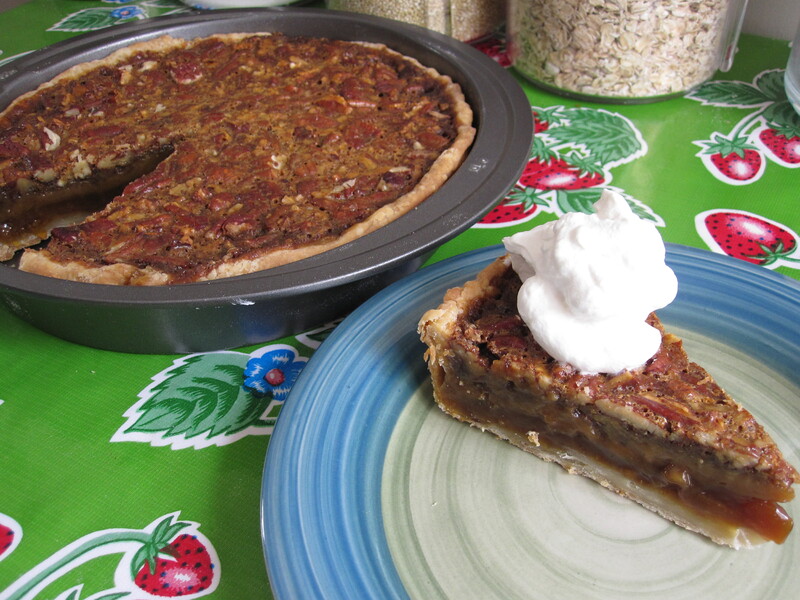 This entry was posted in Pie and tagged friday pie day, pecan pie, pie. Bookmark the permalink. I didn’t think of replacing the corn syrup, now I need to try the Joy of Cooking recipe again with a nice modification. 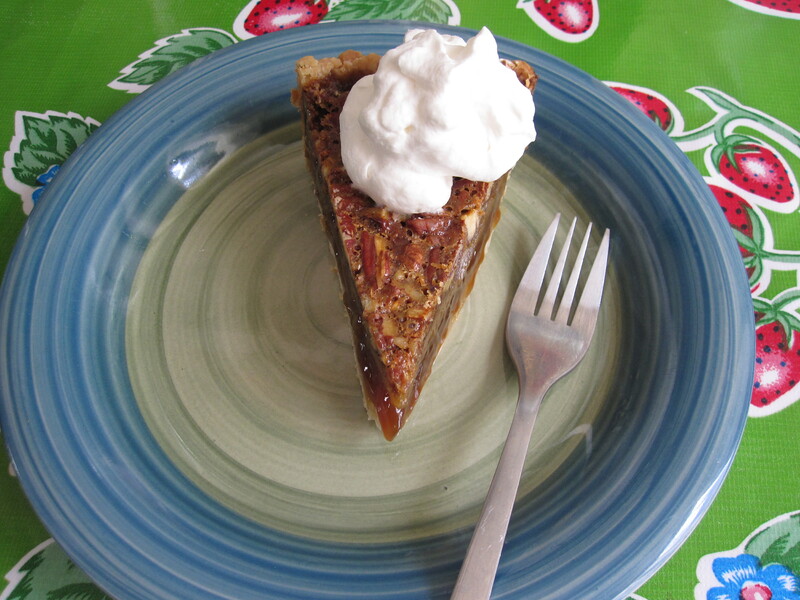 Cool pecan pie recipe , maple syrup is a nice substitute also is agave syrup. 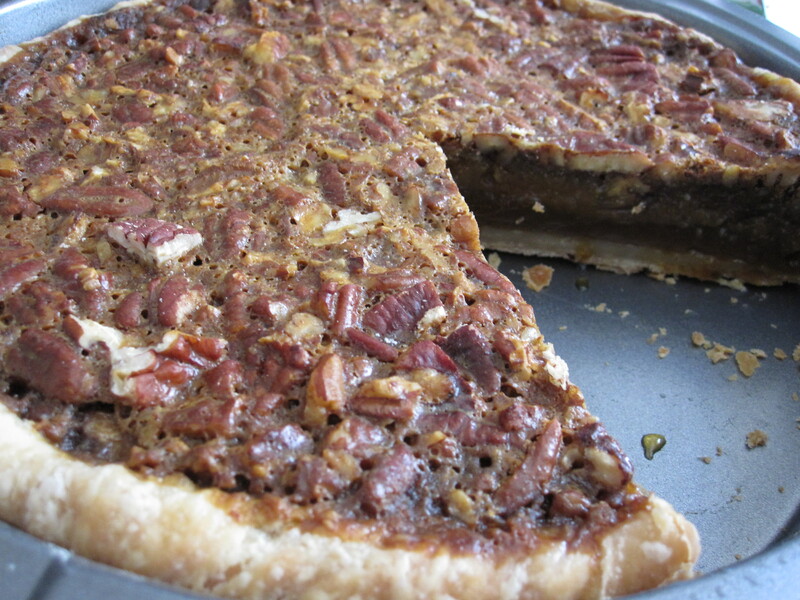 I aslo agree with you a pecan pie must really be enjoyed for the whole year round. HOORAY! for pecan pies!! !